The Groma is a device used by Roman surveyors, the Agrimensores, to align surveys and set out right angles. There are two schools of thought regarding the fundamental design of the Groma. This paper deals with that controversy, using a practical approach, based upon surveying in the field. 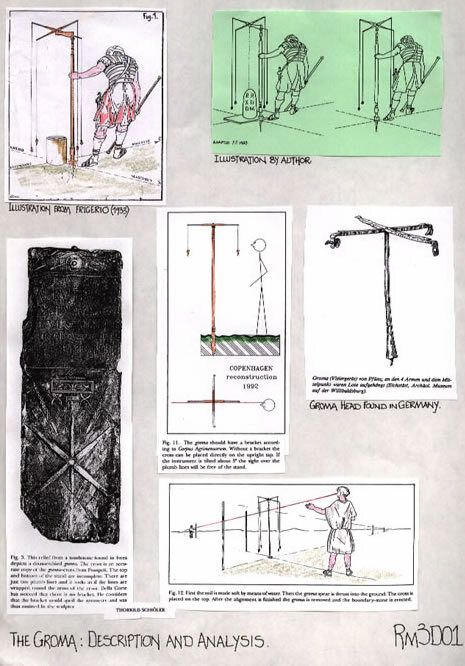 It is the fact that we perceive the ‘Romans’ as a very practical group of peoples, that has led me to question the very erudite papers written concerning the Agrimensores surveying implement, The Groma. Following the publication of the text, “The Pompeii Groma in New Light”, Thorkild Schioler, 1994, where-in the author argues that the reconstruction of a Groma by M Della Corte, in 1912, was incorrect, that the necessity for a practical approach became paramount. T. Schioler argues that the cantilever arm indicated in that reconstruction, is not shown on a carving [tombstone], nor has it been found on an archaeological site. However, within the photographs and drawings of the Tunisian Groma, from El Djem, very definite cantilever arms were indicated. These take the form of ‘double ears’, and, from their design would appear to lock into grooves on a separate timber unit. Thus the practicalities of the design and possible usage must be investigated. Whether the paper by M Della Corte or Thorkild Schioler is the more correct, only a thorough investigation will establish. To discuss this with some detachment, requires an analysis, therefore of both papers. But, as Schioler’s paper includes all the pertinent information from the former, it will be used solely as a reference point. Thus Figures noted are from that paper. The excellent sketch given at Fig. 1, from F Frigerio’s book dated 1933, shows an Agrimensor locating a cantilever arm Groma over an extant boundary marker. This diagram illustrates the total practicality of the Groma’s form, in that a central plumb bob could be used to ascertain the exact point of confluence of the Decumanus Maximus and the Kardo Maximus. The cross bar can then be pivoted to give an exact alignment when sighted string to string. Well, that is one theory! The figure 3 ‘Tombstone Carving’, appears to show three plumb bobs [ not two as stated] , and could have had a fourth or even fifth, but the degraded face of the stone makes it uncertain as to what was originally portrayed. But if this Groma is as portrayed in figs. 11 or 12, then the use indicated in fig. 12 is practical, provided there are no impediments, to the location of the staff. This would not be the situation should a Cippi or boundary stone exist. The description in the text, page 50, states, ‘Fortunately, this is common geometrical sense’ [to set a cantilever arm over the centre of a stone], however, it then continues, ’But, is it an absolute necessity’. The word ‘absolute’ should be ignored, little is in surveying technique. The ‘boundary stone’, probably 0.5 metre diameter, standing on a square plinth for stability, is the setting out point for checking, or future survey extensions. This setting out point was a major factor in any survey, and required to be properly and permanently marked. To set a Groma adjacent to the stone or base of a marker, without a cantilever arm, would mean an offset of some two Roman pedes. But, this position could only be used to align either the KM or DM, not both. Thus we have the double setting out of the perpendicular lines, or two Groma were required. To use an instrument for surveying that introduced the necessity to continually offset lines for dimensions and setting out, would surely be modified by experience. ‘expected to be laid out with great care and to act as a check on the accuracy of the measurements during the conduct of a survey’. Returning to page 50, Schioler states, ‘By taking aim from one rod to the next we reach the next node. Each sighting gives an error’. This error is explained as follows; “error +/- 1.5 per mille, one rod to next, +/- 1000mm in 710m”. This error computes at 1; 305 and is unacceptable for a direct alignment. Why are the rods being aligned, when there are strings hanging from the Groma, the fineness of which can be used for a very highly accurate alignment. This will be discussed later, in depth. The next problem discussed by Schioler is that of “the cantilever load causing a bending moment in the pole”. He states that a 6Kg mass would create a static deflection of 7cm or a dynamic/static deflection of 14cm. This is highly questionable on two points, a) Engineering and, b) practicality. If a cantilever arm Groma was used by the Romans, would they allow such a defect, a ‘bending post’ on an instrument of required accuracy? In practical terms, it could not be allowed to happen, because a free running pivot cross bar with four plumb bobs would always try to achieve equilibrium, by virtue of gravitational action. It could not be held out of balance. 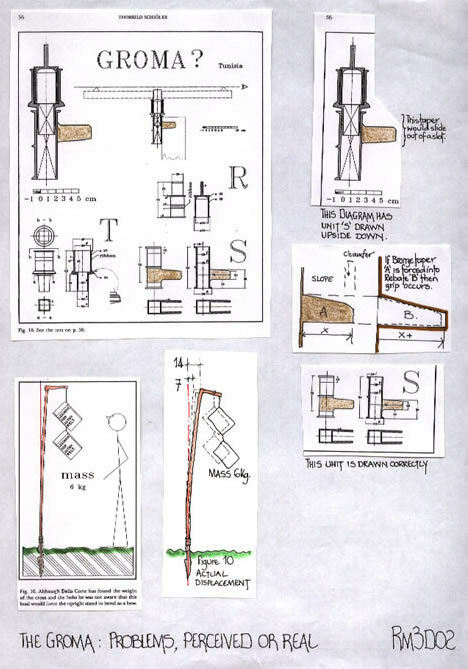 These two points indicate that, if the Groma was of a cantilever format, then the post was certainly greater than the 32mm diameter suggested, and, if the post was out of plumb, there was the likelihood of a turning moment created by the plumb bobs. 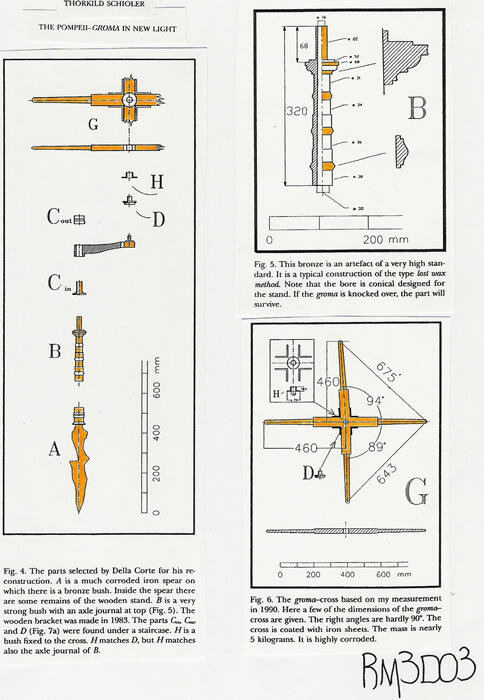 Referring to page 52 and diagrams 11/12, we see that it is claimed necessary to tilt the Groma by at least 3 degrees to achieve a sight line on the plumb bob strings,[note, page 50, sight rods and inaccuracy]. It takes imagination to intimate that the Roman Instructors would teach pupils how to use a Groma by stating’ spike it into the ground and then lean it over’. But if we examine the diagrams of the bronze castings of the Groma, a different picture emerges. The casting, which fits onto the post, has a 32mm diameter socket. It also has a 38mm flange dimension [see fig.5].Therefore, why must the pole be the size of the ferrule, and not at least the size of the shouldered flange. If the Romans required an upright pole to ensure stability, and to ensure that wear, caused by the constant placing and removing from the ferrule were adequately accounted for, surely they would use a post of diameter greater than 38mm. Thus a pole of 50mm could be shouldered from the ferrule diameter of 32mm and produce a good fit, with stability. If figs. 3 &14 are studied together, neither show an indent from the bronze top, to the pole, and, the base [part A] is a greater diameter. This would indicate some knowledge of natural tree growth, in that a coppiced pole would be of greater diameter at the base than the top. We can therefore assume a pole of base diameter 50/45mm and top diameter 45/40 would have been utilised. Therefore, we automatically have a greater resistance to any cantilever bending moment. It should also be noted that when wear takes place, a shouldered end can easily be bound with grass etc., to ensure a tight fit. But, a thin pole would require to be fully bound to stop any pivoting of the Groma head on the ferrule. [i.e. see P55 appendix; ‘packing wrapped on cylinder’] This would then require frequent re-binding to remain firm. Returning briefly to the idea that the Groma may be tilted, and to avail the user a view to the plumb bob strings, by calculation from the pole diameter, and mid point string position, this is a c4.5 degree tilt angle. This tilt angle is equalled by the calculation at 1800mm height of a 6Kg mass static deflection. The argument is therefore quite finely balanced, for or against, plumb bob verticality. By one means or another, the poles are out of the vertical. An 1800 pole, with a c4.5 degree list, would be 141mm difference in top to bottom position. Common sense alone precludes this! What does the surveyor align the second pole with? Does he try to ensure the base is correct, and then tell his co-worker to lean the next post over, hoping they will align. Or, are all poles as vertical as possible, so that when viewing from one to the next, it is possible to stand away and use stereoscopic vision to align them all. The second line survey alignment from the groma position must surely preclude the tilting of the Groma. How can it be tilted in two directions at one time, to accommodate the right angle of the DM + KM. It would appear that in order to disprove one theory, the author has merely substituted a flawed discussion paper. The conclusions indicate a methodology for using the Groma which is distinctly unscientific, impractical and certainly prone to introducing many inaccuracies. The description of the El Djem Groma, fig. 18, is of a partially pivotal construction. It uses a quadratic casting, unit T to locate into unit S which then provides the 90 degree shift for the KM & DM, or other angular bearings by the circularity of T to R. The unit R has a tenon top, which would indicate a bar setting along it. However unit S has two locating tenons or ears, which from their shape, would have locked into two grooves. It is normal for such tenons to have one face sloping in order that the tenon ‘bites’ into its groove and is held. But, the complete assembly diagram, top left and right fig 18, indicates item S in a reverse position. With the slope face at the bottom this will allow the unit to slide out under its own weight. There is also a secondary slope face on the unit, which ensures a good grip, but, also allows for the unit to be ‘jiggled’ for insertion and removal. The two ears are thus capable of insertion into slots in a timber bracket, which would allow the main body of the Groma to be cantilevered over a boundary stone. But, the correct base of unit S has a flange diameter of 38mm, and as such would be ideal for the shouldered pole previously discussed. Thus the El Djem Groma is capable of being used in both modes, single or cantilever. That surely is the signature of a practical and knowledgeable people. By relegating this example to the appendices, the author has missed the opportunity to directly compare these Groma’s, and perhaps establish the design changes made for greater surveying practicality. The design of the Groma has evolved. The appendices of the paper include two examples of a Groma being used ‘out of alignment,’ one in tilt mode, one a deformed unit. The ’tilt mode’ has been effectively dismissed. The pivot is a cylinder, and these tend to rotate when out of balance, unless the friction component is very high. The ‘bent’ unit is quite possibly a repair to an original, as diagram 6G. It can be used quite satisfactorily, as the text indicates, but what the text fails to note, is that one arm is aligned, fig 17, from the 3 to 9 positions. Therefore by sighting the diagonal strings an alignment will be quite adequate. However, if it was used in cantilever mode, the diagonal sighting of the strings is quite possible, i.e. the changed position of the pivot point would change the alignment, unless the pole was offset, as in the situation of a marker stone. Thus we see that there are many opportunities for practical knowledge in the field to vary the type and use of a Groma. a) The surveyor required an offset arm to counter existing marker stones. b) If the offset arm length equalled the normal arm length, they were inter changeable, and could be used to position each other at a survey point. c) The weight of the ‘head’ at 6 Kg., necessitated a pole of 50mm diameter. d) Natural tree growth and a variety of sizes necessitated shouldered poles. e) The four plumb bobs allowed the pole to be set perfectly upright. f) The ‘head’ could then be alternated from direct to cantilever. g) Either aligned or diagonal string sighting was thus possible. Not via Pole. h) Several poles, with prepared shouldered tops, could be set out at the required centres [actus], and the Groma head transferred to each .Thus the perpendiculars and back-sights could be made to check the alignments. i) The use of the two ‘heads’ allows one surveyor to align, and extend a line, whilst the other sets out the perpendicular lines. j) Accuracy is compromised as soon as verticality and corners are combined. Does the surveyor lean the poles at the corners in two directions at once? Thus we must be very careful not to ascribe to the Roman Surveyors a level of accuracy that is not achievable. We constantly read comments regarding how accurate the Romans were. In fact, unless we know the precise survey markers that were used, we just do not know what accuracy was achieved. We must not compare the Centuriation of land, where the subdivision was the ACTI of 120 pedes, with a distance of even a Roman Mile of 5000 pedes. In the Roman mile there are just less than 42 Actus, and proportionate error is just the same. We should also note that a grid plan , a piece of graph paper on the landscape is a traditional method of planning for Greek and Roman Surveyors, and like a piece of graph paper we may use the lines, the interstices or spaces, or all three to create the pattern we desire. Schioler T., 1994, ‘The Pompeii- Groma in New Light’, Analecta Romana, Instituti Danici XXII. Ferrar M J., 2004, ‘Agrimensorial Texts; Practice or Theory’, see N M R, Swindon , Archive. And this web site reference Rm4. Ferrar M J & Richardson A., ‘The Roman Survey of Britain’, B. A. R. 359, British Series, 2003.